So I've been doing a bit of research and I found there are a few tournies in my area run by my local Press Ganger. Because of this I decided I wanted to make a dead hard tournament list to take to some of these. I rested on eCaine. I love his model, and the way he plays. I set about building a list designed strictly for him. The idea here is to create an army that operates without its warcaster thus eCaine is free to do whatever he likes. This is the list I played and had a lot of fun. I made some mistakes being my first game with eCaine but I still managed a 2nd turn caster kill. The way this works is the Stormblade stays near the Stormclad and Strangewayes. Thus giving him two focus. Then you `jackmarshal to charge/boost to hit/boost damage or whatever. So effectively the jack is running on all cylinders even tho its marshaled. The defender is just there for a long range Magic Bullet target as well as pounding heavy jacks. Hes mainly there to also use up Caine's jack points and to provide some solid melee power. Rangers are there for obvious reasons. This list played how I thought it would and eCaine was fairly free to run around blasting whatever he felt like. Turn one he wracked up a min unit of IFP + UA, good stuff! Reinholt is there to add the extra shot to Caine. The Squire is there to give him another shot when he does his assassination run or needs to shoot a heavy jack into dust. eEiryss is part of the Assassination package. She disrupts enemy jacks that I can't meet head on, and pops buffed casters camping focus so eCaine can do his thing. Getting back to the Stormclad package I'm debating on weather or not to swap it out for another defender `Jack marshaled by a Gun Mage UA to give it snipe for a 20" shot that I can throw magic bullet on. The gun mage unit itself can be used to push back heavy jacks and other things that I feel are getting too close. 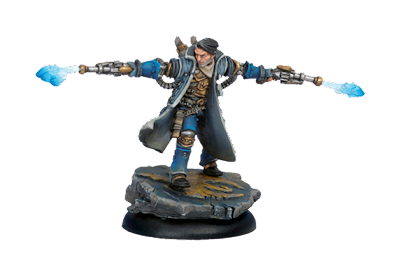 With the extra point I was thinking of getting a Stormsmith to help disrupt more jacks to let eCaine get his business done. ~So what do you guys think? If you have any suggestions lemmy hear them!